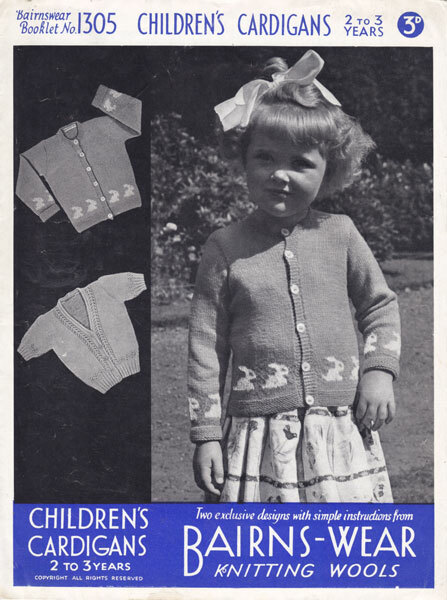 Bairnswear 1250: Vintage toddlers knitting pattern from 1940s. Three dear little cardigans, one with ducks round the bottom, one with Dutch boys and girls the other with checkerboards round bottom. Knitted in vintage 3ply to fit 20-22 inch chest. Try modern 4ply with a change of needles if needed. For more patterns with motifs see the children's fair isle pages. 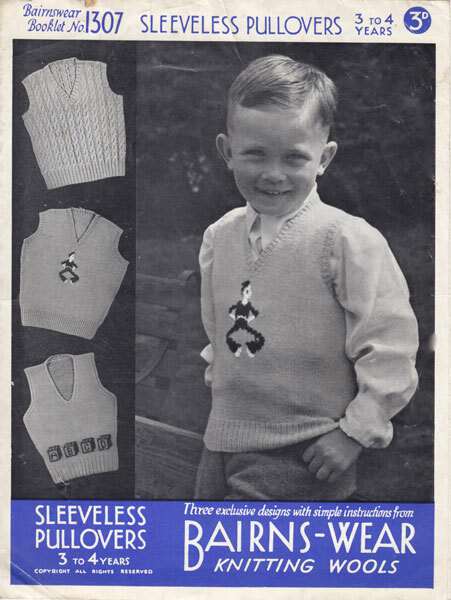 Bairnswear 1350: Fabulous child's soldier fair isle cardigan jumper vintage knitting pattern 1940s. This lovely pattern has soldiers on guard round the cardigan and on the yoke of the jumper, plus another set with fair isle band on both cardigan and yoke of jumper. To fit 23 - 24 inch chest. Worked in vintage 3ply, so try a tension square in modern 4ply and see if this works better. Bestway84-6: Great vintage baby boys buster suit with simple fair isle jumper, to fit 21 inch chest. Worked in vintage 3ply, always work a tension square. Bestway 84-8: Great vintage knitting pattern for boys suit with fair yoke on jumper. To fit 22 inch chest, instructions for jumper and shorts, jumper has little buttons to fasten. From the book above. 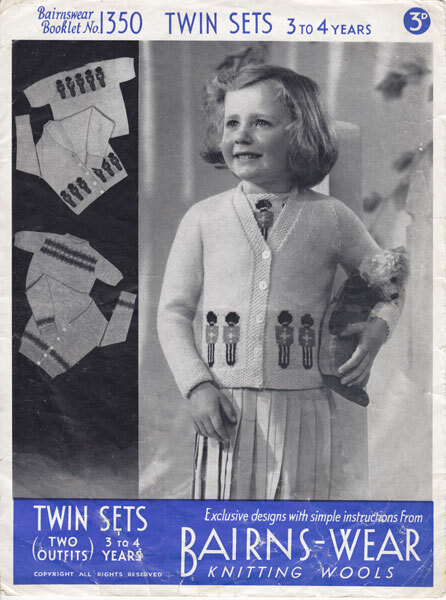 Bestway1885: Great vintage baby fair knitting pattern 1940s. This little pattern is for babies cardigans with chick, flowers and check fair isle design, intarsia. Worked in vintage 3ply, try modern 4ply in a tension square for size required, for small or new born try modern 3ply. To fit 18-22 inch chest approx. In sizes birth - 6months, 6-12 months and 12-18 months. Simple designs on a plain stocking stitch background. Bestway2079: Great vintage baby cardigan with fair isle border and V neck knitting pattern 1940s. This pattern has two designs, on of which is one with fair isle borders of little flowers, very sweet. To fit 1-2 years 22 inch chest, the fancy stitch one is 21 inch chest. But if worked in modern 3ply the sizes will come up a bit smaller so would suit a younger baby. 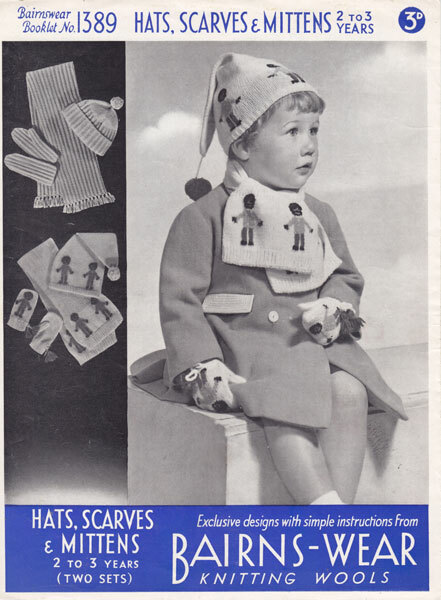 Bestway 2182: Great vintage fair isle knitting pattern for baby 1940s. This little gem is so sweet, a miniature traditional fair isle jumper! Knitted in vintage 3ply, so try modern 4ply for sizes stated and modern 3ply for a smaller size. Always work a tension square and change needles if needed. To fit 6-12 months and 1-2 years. There is another design with baby cables, another very sweet pattern. Two for the price of one in this pattern. The Fair isle one is for 1-2 years (23.5inch chest) and the cable one is for the younger size 6-12 months (20 inch chest). The fair isle colours suggested, so would be typical of the time, white ground, with shell pink and pale blue. This is because as wool was rationed, it could be made from left overs from baby, or adult vest and underwear knitting or unraveled wool. But would just as cute in brighter modern colours of your choice. Bestway B2334: Great vintage baby knitting pattern for fair isle cardigan 1950s. This colourful little pattern has fair isle borders at waist, cuffs and shoulders. To fit 1-4 years in vintage 3ply, so try modern 4ply in a tension square and change needles if needed. For a smaller size try modern 3ply. Chest sizes 20.5, 22, 23.5, and 25 inches. Bestway A2417: Super vintage baby fair isle knitting pattern summer pram set 1940s. This is a lovely pattern and a good introduction to fair isle as it is so simple. To fit 6-12 months, 21 inch chest. For a smaller set try modern 3ply. Great little spring set or even for a sunny autumn. Worked in vintage 3ply so try modern 4ply in a tension square and change needles if needed. There are instructions for bonnet, bootees and matinee jacket. I am about to make one of these in alpaca, so will put the results on site. Bestway A2648: Great vintage baby cardigan knitting pattern simple fair isle border 1940s. This is a lovely pattern and a great introduction to fair isle. The little cardigan is knitted in vintage 3ply, so try modern 4ply in tension square and change needles if needed. There are instructions for 9months, 18months and 36 months (20, 21 or 15 inch chest. Bestway A2680: Great vintage baby fair isle knitting pattern 1940s. Little boys jumper and pants set to fit 6-12 months, 22 inch chest, with ducks around the bottom of the jumper. Worked in vintage 3ply, so try a tension square and change needles or try 4ply. Bestway B3179: Great vintage toddler trouser suit knitting pattern 1950s. This little bright set is knitted in double knit, but still work a tension square and change needles if needed. To fit 18 months to 30 months or 22 to 23 inch chest. And 30-42 (two and half to three and a half) 24-25 inch chest. Larger size made by using larger size needles - the easiest way to make a bigger size. Bestway B3292: Great vintage babies fair isle jumper knitting pattern 1950s. This is a lovely pattern with three different designs, dogs, chicks and flowers and in double knitting yarn. To fit 1-2 years (21-22 inch chest and 3-4 years 23-254 inch chest. Easy to knit raglan jumper for a tiny tot.